Peripheral neuropathy is a condition that develops as a result of damage to the peripheral nervous system. The peripheral nervous system transmits information from the brain to the spinal cord and to the rest of the body and sends sensory information back to the brain and spinal cord such as that your feet are cold or that your hand is in pain. 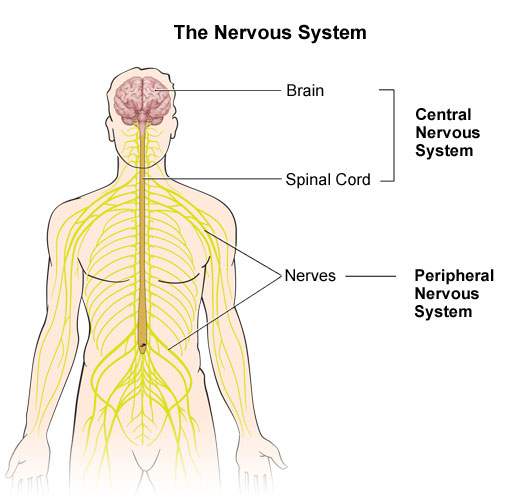 The peripheral nerves also send signals from the brain and spinal cord to the muscles to produce movements. When damage occurs, these important messages can be interrupted or disturbed. As a result, patients may either feel burning, tingling, pain or experience weakness, numbness, loss of sensation with the feeling of wearing a thin stocking or glove. It usually occurs in the hands and feet, but it may also occur in other areas of the body. Symptoms depend on whether the motor, sensory, or autonomic nerves are affected. Damage to motor nerves, which control voluntary movement, contain symptoms associated with muscle weakness, painful cramps, muscle twitching, and decreased reflexes. Damage to sensory nerves, which transmit information such as a light touch, contain symptoms associated with impaired touch which is most common in the hands and feet, as well as difficulty coordinating complex movements, inference of pain and temperature sensations, and neuropathic pain. Autonomic nerve damage, which controls organ activity, contain symptoms associated with the inability to sweat normally, loss of bladder control, irregular blood pressure, and GI symptoms. There are many different factors that can cause peripheral neuropathy such as physical injury, disease, and exposure to toxins. Physical injuries like sudden trauma and repetitive stress can cause neuropathy from damage to the spinal cord, pressure on the nerves from broken or dislocated bones, or from swollen ligaments, tendons, and muscles that constrict the nerves. Diseases and their associated processes can be related to peripheral neuropathy. Type II diabetes, the most common cause of peripheral neuropathy, is characterized by long-standing blood glucose levels which damage nerves by interfering with their ability to send signals and also weakens the walls of small blood vessels that supply the nerves with nutrients. This is also a similar cause of neuropathy from small vessel disease. Autoimmune diseases like Sjogren's, lupus, and rheumatoid arthritis can also cause neuropathy when the tissues surrounding the nerves become inflamed and overtime these conditions can lead to the destruction of joints, organs, and connective tissues which makes the nerve fibers more susceptible to compression injuries. Infections from viruses, bacteria, fungi, and mycobacteria can also cause neuropathy when they attack nerve tissues causing damage to the sensory nerves such as in conditions like shingles, Epstein-Barr virus, and herpes simplex virus. Other diseases like kidney disorders, cancers, and neuromas can also lead to peripheral neuropathy. Exposure to toxins can damage nerves and cause peripheral neuropathy in cases like medication toxicity, environmental or industrial toxicity, heavy alcohol consumption, or metabolic toxin build up. Medication toxicity can occur as a side effect of some medications such as those to fight infection and leads to neuropathy. Environmental toxicity such as lead and mercury from the environment are known to cause neuropathies. Excessive alcohol consumption damages nerves and frequently leads to nutritional deficiencies such as thiamine and folate which also contribute to nerve damage. Lastly, our own metabolic toxin build up when the liver is inflamed or malfunctioning can also irritate the peripheral nerves causing symptoms of skin formication with a sensation of tingling, "pins and needles", or small insects crawling on or under the skin.